The Pathfinder Program covers the foundational material that every life coaching client needs as part of his/her personal development. What is the Pathfinder Program? The program covers essential personal development components such as: values, beliefs, goals, skills, support and defining success. These components create the Pathfinder Success Framework (above). Material is organized in such a way that clients can easily see how life coaching ideas fit together to help them move forward. It includes two professional-looking, personal development workbooks with over 74 pages and 20 exploratory exercises between them. There is enough material in the program to fill a minimum of 6 coaching sessions plus an additional 6 months of monthly follow-up/accountability coaching. The program can be used as a personal development tool for yourself, used with your coaching clients, used as a framework for group coaching programs and/or a frameworks for short courses. Invest once and re-use the material with as many clients as you like! Ask as many questions about the program and how to use it in your business as you like. It can be hard for many clients to visualize the tangible outcomes that they are going to obtain from working with a coach. This is especially true when you are working with professionals; they need to see structure, hold something tangible and hear that you know what you are doing. Hand them 2 workbooks in the pre-sales meeting and they will be impressed. We have been testing and refining the Pathfinder Program with our clients and coaching groups for several years and have been blown away with the results. The structure of the program is fabulous, not only for closing one-on-one coaching sales, but also for structuring group coaching programs AND providing content and exercises for a multitude of short courses! 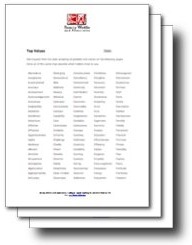 We know that there are coaches out there who would love to have their own program like this, packed with so much content, but who just don’t have the time to write one. We believe in this tool and want to get it out there so that as many people use it as possible. We put in the hard work and invite you to turn our program into a springboard for your business. We are offering you the opportunity to license a copy of the Pathfinder Program to your coaching business for a low, one-off fee. This means you can use this program as many times as you want, regardless of how many coaching initiatives you use it for. All the material is in electronic format, so you can send it and print it with ease. How is it different from the Starter Kit and Tool Kit? 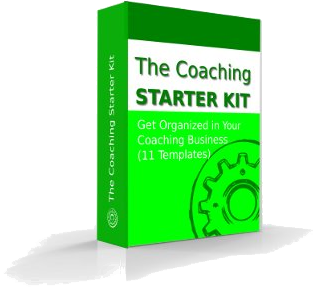 The Coaching Starter Kit contains all the essential templates you need to for run a professional coaching practice. All templates can be re-branded with your own logo/name. 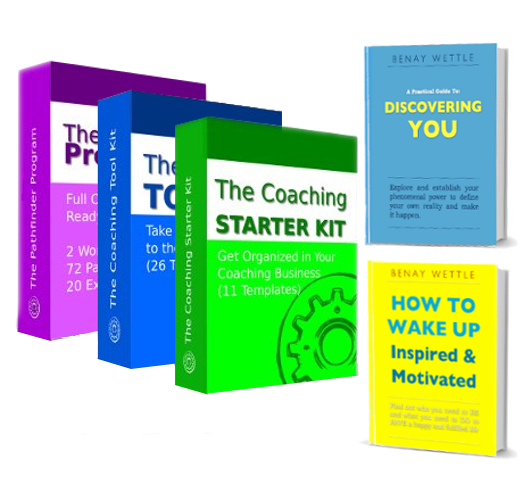 The Coaching Tool Kit contains tools and templates for use in coaching sessions with your clients and can be re-branded with your own logo/name. The Pathfinder Program is a complete personal development program that you can use with as many clients as you like. It includes 2 workbooks that are discretely branded as a Benay Wettle and Associates product and cannot be re-branded unless you invest in the .DOCX Version (then you can change what every you like!). The workbooks are pretty easy to integrate into your coaching. 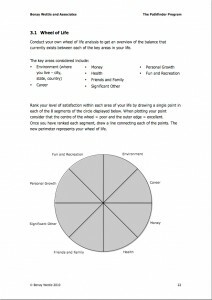 You can use it with one on one coaching clients as well as for group coaching (my favorite!). One-On-One Coaching – If you use the Pathfinder Program in your one-on-one coaching sessions you can give the workbook to clients when they join and get them to do the exercises as homework. One option is to let them do the exercises in their own time and bring any insights or questions to their coaching sessions on an adhoc basis. The other alternative is to use the workbooks as the framework for your first 6-9 sessions (you would cover a chapter per session). Group Coaching – For group coaching I suggest getting 5-10 people together for approximately 2.5 hours every week for at least 6 consecutive weeks. At each meeting you should complete one chapter. In this case participants should do at least some of the exercises during the session and discuss their findings with a partner. Then you facilitate a full debrief with the whole group. As a coach who invests in the Pathfinder Program, you are able to re-use it with as many clients as you want to. 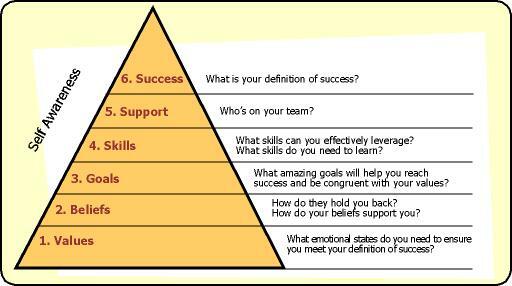 You can email it, photo copy it, use it in your workshops. If you buy the PDF Version, you can not change the material in any way and Benay Wettle and Associates branding must be retained./If you buy the .DOCX Version, you can change whatever you like. 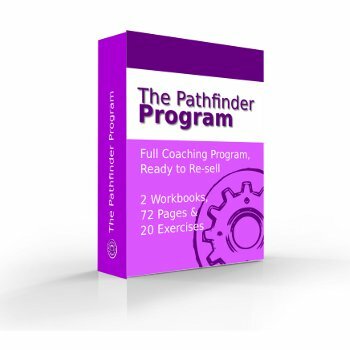 You must not resell the Pathfinder Program as a stand-alone item – it is a tool to use in conjunction within the coaching initiatives you offer as a life coach. Your clients can only use the Pathfinder Program for their own personal use. What will my clients learn by using the Pathfinder Program? to get through the program? We typically get a minimum of 6 coaching sessions out of the Pathfinder Workbook – 1 session per chapter. The client does the exercises at home before the session and we go though the learning’s during the coaching session. 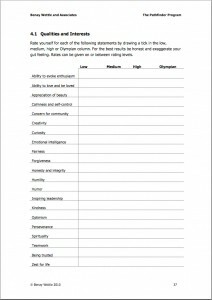 The Goal Tracker Workbook usually takes 3-4 coaching sessions to complete the exercises. After the exercises are complete we offer shorter and cheaper accountability coaching sessions for the next 6-months to make sure clients stay on track with their plan and support them to make the behavioral changes they need to achieve their vision statements. in a 6-week course style? The Pathfinder Program is great for a 6 week program. I ran 2.5 hour meetings for 6 weeks and covered one chapter per meeting. 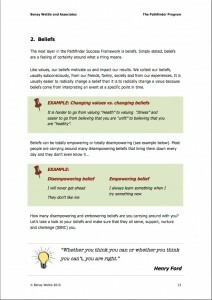 So week one is values, week two beliefs and so on. My groups were between 10-15 people but that’s just a number I like working with. You can do as small or as big as you want. Pricing really depends on what your audience is prepared to pay for the results they are going to get from the group. Just off hand, I think that somewhere between $20-$80 per meeting is a great price. As the facilitator, you need to introduce the main concepts and talk about why they are beneficial to your audience. Give participants time to work though some exercises alone and then let them discuss with a partner or in a small group. This builds great bonds between members. All you need to do is be available if someone has a question and to keep groups discussions flowing and peaceful. At the end of the meeting you should facilitate a group discussion with the whole group. I ask these questions: what did you learn, what would you like to know more about, what would you like to share. Then wrap up with what they need to do/who they need to be until the next meeting. In my experience people are too busy with their life to ‘jump ahead’. They love the sessions because it sets aside a time for them to focus on personal Development, which otherwise gets overridden by general day-to-day tasks. Every once in a while someone will jump ahead. I think that is great because it shows that they are totally dedicated to their personal development. That person can just sit quietly or take a coffee/toilet break during the alone part of doing the exercises. Then they join back in for the discussion component. We’ve done the work so you can focus on coaching. I am very happy about my purchase. I am now starting my coaching business and this has saved me lots of time. Why Just Buy One Program When You Can Purchase All of These for One Special Price!